hey! remember me? 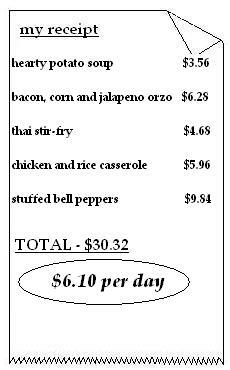 i know it has been a while since i issued a $30 for 5 meals! it has been hectic on our house with 4 kids under 6! no more excuses, though. i will work hard to get these editions out every month, i promise! 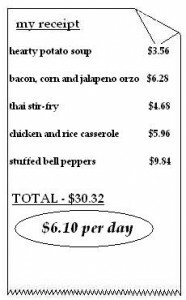 since it is still cold outside, i figured we can stick with what winter knows best…comfort meals. 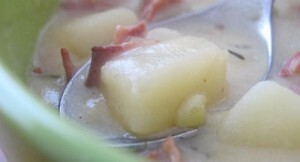 hearty potato soup – this soup is as hearty as they come. we start with bacon. yes. bacon! then i added in celery, garlic, onions, chicken stock and other aromatics in with the potatoes. once the potatoes were nice and tender, it is all finished off with some cream. great with crusty bread on a cold winter day. 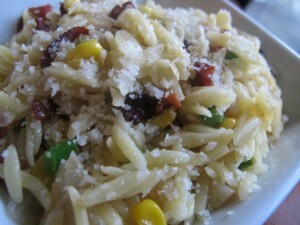 bacon, corn and jalapeno orzo – okay, i know there seems to be a trend going on here with bacon in this edition. lol. in this recipe we start with bacon. again. in the rendered bacon grease, i added corn, jalapenos, fresh garlic and onion. this flavorful sauce gets poured over orzo that was cooked in chicken stock and it all gets topped with parmesan cheese. it tastes even better the next day. 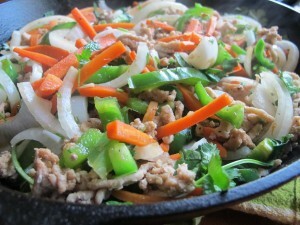 thai chicken and vegetable stir-fry – another quick and easy meal to make. ground chicken is sauteed in a ton of fresh garlic. i tossed in a beautiful variety of fresh veggies and added in some fish sauce and soy sauce. i then topped it all off with handfuls of fresh basil and fresh squeezed lime juice. this meal is a new staple in our rotation of meals and one of my hubby’s new favorites. 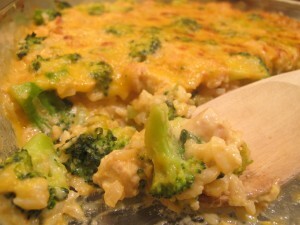 cheesy chicken and rice casserole – this casserole is definietly something you have to make. there is no need for a can of soup in this one. i seared some chicken with fresh garlic, onions and brocolli. added some flour, chicken stock, and cream to thicken the flavorful sauce. it all gets baked with some rice and cheddar cheese for a tasty result. double up on the casserole and freeze! 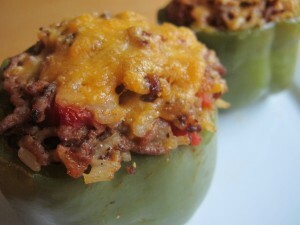 cheesy stuffed bell peppers – i love stuffed peppers! you have to try this recipe! i seared the ground beef in some canola oil with fresh garlic, onion, worcestershire sauce, diced tomatoes and other spices. i allowed the mixture to simmer in tomato sauce, added in the rice and topped it off with some cheddar cheese. the perfect filling for our peppers! they were baked until slightly crunchy and packed with flavor. how did we do money wise? good!